Book Review - Can Anyone Hear Me? 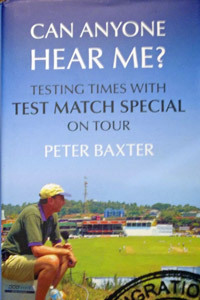 Corinthian Books, an imprint of Icon Books Ltd.
Test Match Special has been a national institution for many years and many of us have cause to be very grateful to it and therefore to Peter Baxter for brightening our days and nights. Many of my fondest memories have been listening to the coverage when a radio has been at my side whether or not it should have been. Peter, also a reasonably prolific writer bringing Test Match Special not just to our ears, has brought this excellent and enjoyable book out about the art of producing Test Match Special from overseas. One can only hope that production within England is a lot simpler than it appears to have been during winter tours. Peter details each country which he toured and covers the joys, the frustrations and the many issues encountered in setting up the production. Disputes over contracts, getting the lines fixed and, in cases, having to commentate from a telephone or indeed, in Galle, from outside the ground were all part and parcel of the package in getting commentary to listeners presumably blissfully unaware of what had been required to bring it to our ears. Extracts from Peter’s diaries kept at the time also make his writing even more interesting and also shows a dry wit. He writes lovingly of the programme as might be expected and in a humble manner. His favourite tour – to India in 1984/85 – had started discouragingly with the assassination of Indian prime minister, Indira Gandhi, and ended with a 2-1 victory for England. At the end of each chapter, highlights of what were considered England best overseas performances – not necessarily “champagne moments” – are mentioned in this highly enjoyable book. As a complete non-entity where technological communications are concerned even in this day when I am told it is that much easier, I admire – but did not delve into trying to understand the logistics – Peter’s knowledge, tolerance and acumen in producing a programme which has given people so much pleasure over the years. We owe Backers – or Bartex – many thanks for doing so much during his long stint as Test Match Special producer and this book should bring great pleasure to the legion of Test Match Special fans.